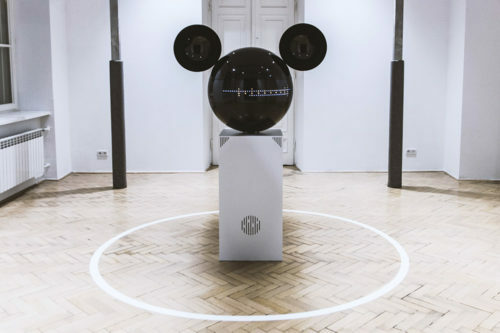 MICKEYPHON (or MIKIFON in Polish) is an interactive, audiovisual, kinetic sculpture inspired by Mickey Mouse character and created for Disney by a group called panGenerator.The Mickeyphon samples sounds from the environment, rotating in the direction of their source, and then transmutes them into musical rhythmic sequences. The final sound is shaped by the audience taking part in the interaction with the Mickeyphon. The sound layer system is enriched with interactive visuals presented on the cylindrical display, located in the moveable part of the Mickeyphon. The sixth international designers’ festival Prague Design Week took place in Republic Square 7 in centre of Prague. Seven-day event featured the creation of dozens designers, jewellers, fashion designers, creative people, studios, schools and firms.